Hello everyone and welcome to The Anime Pulse: First Reaction. A boy has an involuntary power to rewind time in one to five minute intervals. He uses this power in order to help those in need, but at the same time, he has trouble connecting with his own heart/emotions. 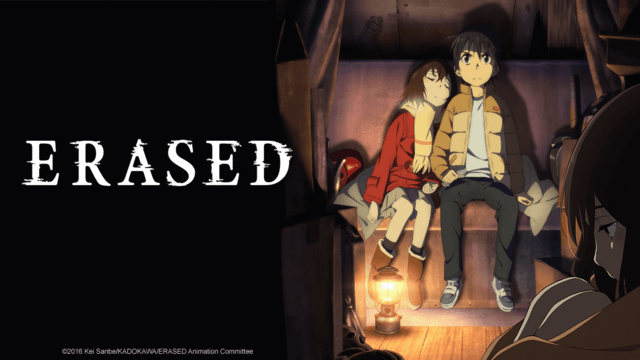 The alternate title for this show is ERASED, but it’s also known as Boku Dake ga Inai Machi. Right off the bat we are introduced to Satoru Fujinuma. He’s a struggling manga author due to not having a connection to his own feelings and that’s coming through in his characters. As a part-time job, he works as a pizza delivery driver and this is where we are introduced to his ability to jump back in time. While on a delivery, he time leaps and notices the driver of a truck passed out behind the wheel. He then makes a daring rescue, saving the life of a little boy. It seems that Satoru has no control over this ability as even he seems a bit stunned that it happened, like there was no forewarning on his part. With the introduction to his character out of the way, we begin to set up the main story of the series. There was a girl that he saw standing alone in the park back when he was young. He wanted to say something to her, but decided not to. Later that night, she ended up getting kidnapped and murdered by a local criminal. Satoru wishes that he could have walked her home because if he did, she would still be alive today. Satoru’s mother comes to visit and while they are out shopping, Satoru has another time leap but he can’t seem to notice what was out of place. His mother, who used to be a news announcer, kept mentioning that the cases of those kidnappings/murders were never solved. Before we find out more about Satoru’s mother, the culprit breaks into Satoru’s apartment while he’s at work and murders her. Satoru comes home and finds the body but is mistaken as the murderer. As he is fleeing from police, he time leaps, but it’s much further than just one to five minutes. He’s back at school as a kid and has been given a second chance to solve the mystery of the kidnappings and prevent the deaths of that girl and his mother. The premise of this show is pretty interesting and there is definitely enough suspense, drama, and intrigue to hook you. Satoru’s character is played perfectly as he is very apathetic and monotone with little emotions, but when the emotions are invoked, Shinnosuke Mistushima portrays those emotions well. Young Satoru has his own voice actor in Tao Suchiya so it’s kind of nice to see a dual role here for the same character. I’m not so sure right now about Airi Katagiri, who is Satoru’s co-worker. They went to some lengths to introduce her character, but with Satoru time leaping back that far in the first episode, it will end up being a long time before we see her again.. mayhaps or mayhaps not? There has to be a reason to set up her introduction and her involvement with Satoru outside of curiosity about his powers, but it shows that people can be aware of Satoru’s ability without understanding it as she senses something about him. It’ll be interesting to see how they tie her into the story later on. The show is only slated for 12 episodes so I really hope that this isn’t rushed too much as this looks to be a great series! “Re:Re:” by ASAIN KUNG-FU GENERATION is the opening for the show and served as the ending for the first episode. It’s an okay song, to be honest. I just feel that it’s a bit too upbeat for the kind of drama that this show is bringing to the table. I would have liked to have seen a more softer, maybe darker song to reflect what this show has to offer. Even though the song is decent, it just doesn’t fit for me. Since the opening served as the ending, there is no ending theme to review. YES – This anime has a very intriguing story and has the ability to apply the rules of time correctly by altering past events in order to achieve a new future. I hope the show understands the consequences of altering events, though, but for some reason it just doesn’t seem like the kind of show that will do that. Nevertheless, it’s a murder mystery mixed with a bit of sci-fi. It’s a winner in my book thus far!